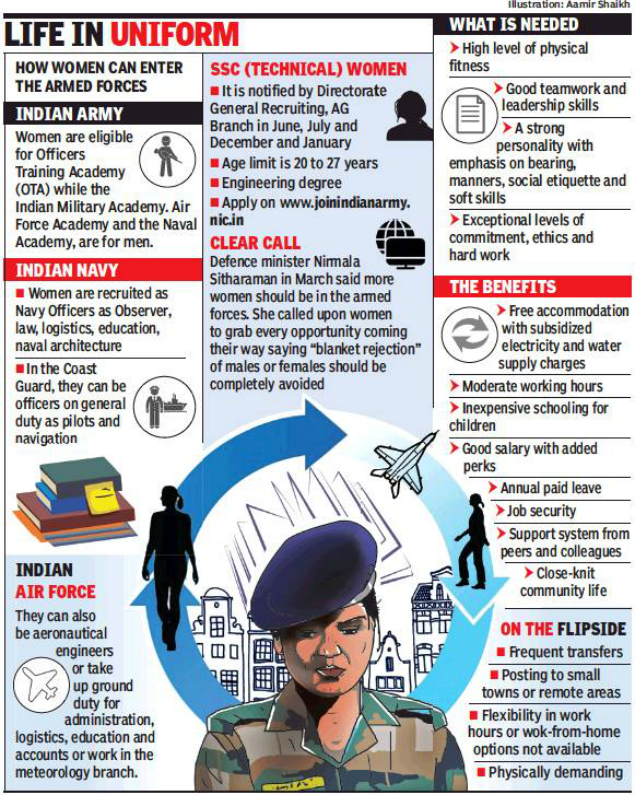 PUNE: Women wanting to join the armed forces can consider the army by taking the Combined Defence Services examination, the NCC special entry exam, and judge advocate general entry scheme. The Air Force common admission test opens up the flying branch for them to pilot transport aircraft or helicopters. The Indian Navy has exciting prospects in the ATC, as observers, in the legal and education departments, logistics and naval architecture and in the catering section. Shraddha Jadhav from Marathwada came to Pune about 10 years ago and joined Abasaheb Garware College. She went into the army wing of the National Cadet Corps. Her performance was noticed in the training and she was picked up for the Republic Day camp. “It was a proud moment to have represented Maharashtra. I will take up a career in defence and prove to my villagers back home that women can also perform in this sector,” Jadhav said. She is preparing for the entrance exams. Sayali Kulkarni from Pune joined the NCC while she was studying in Ness Wadia College of Commerce. “My armed forces examination is in December. If I crack the exam and the interviews, I would be the first in the family to join this field. My mother will be the proudest to see me in uniform,” she said. Sushma Chavan, also a student of the college, joined the NCC unit last year. Navale said there is a 33% reservation for women in a batch. “However, we always have more women joining the NCC each year. Of the 80 intake capacity, at least 40 are women,” he added.